Between The Hunger Games and Brave, I’d be lying if I said I hadn’t been practicing a lot of archery on my Wii. I’ll also admit that I am excited that Pixar is finally making a movie with a female lead. But, as Peggy Orenstein has already pointed out, that shouldn’t be a big deal. In all their success, it’s a bit late for this to be their first heroine. “But what about all the other female characters, you ask? Read this. 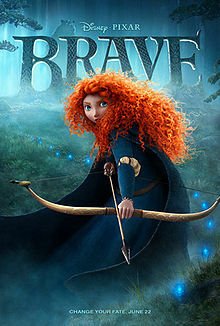 Anyway, I am looking forward to watching Brave when it comes out on June 22nd, but until I actually see the movie they’ve made, I’m not congratulating anyone yet. Given that the main character is a princess, that Pixar has yet to really create an empowering female character, and that it’s still pretty unclear what the full story is about, Brave could seriously fail to live up to the hopes so many have for the film. 1) Seriously. What is the blue thing? What the heck is going to happen after that archery contest? Princess Merida wins her own hand in marriage and then what? This? 2) Do we have to have literal magic? Couldn’t the magic be something like courage or resilience or intelligence or love? I repeat, what is the blue thing? I really hope that the magic element does not undercut the power of Merida herself. Wouldn’t it be better if she can achieve whatever this story is about without supernatural help? Couldn’t she and her family and friends be enough? 3) Speaking of, this is my biggest question: how will the film handle kinship? Clearly they’re going to emphasize Scottish culture and the importance of family. With this context, to stay true to cultural history, while still creating an empowering female lead would be no small feat. Kinship as a basis of civilization has historically leaned on the trading of women through marriage to cement bonds between clans or kingdoms or whatever. That element obviously comes through in the trailer, but when the princess bucks the system what will the film do then? I’m assuming they will err on the side of modernity. It might be more interesting if they didn’t, especially given all the contemporary campaigns to end child marriage, but given that it’s a children’s movie, I’m guessing they will find a happy ending. Also, a tidbit: Kelly Macdonald who voices Princess Merida played Helena Ravenclaw in Harry Potter. Now you know. I actually just spent the last three months writing my freshman English research paper (thirteen pages) on Pixar’s message as a whole/what I interpreted their goals to be and how they achieve them. I illustrated all of my points with specific reinforcement from Marlin in Finding Nemo, Mr. Incredible in The Incredibles, and Woody in Toy Story (all of whom learn that it does not take away from their character to let others into their lives). The characters thereby give children positive adult role models to shape themselves into one day. Granted, there are themes of confidence, nurturing, and adventure as well, that are broad overarching lessons found in each of the Pixar films. However, it is beyond big personalities, and developed pseudo family bonds, where the heart of Pixar’s message lies: learning to be accepting. Because the films are geared towards a younger audience, choosing to primarily have adult lead characters is an interesting decision that underscores Pixar’s real goal of inspiring future generations of good adults. Sorry, I’m rambling off point, the hardest part of my paper to write was coming up with a response to the perceived gender bias, which was really the only really big complaint against the company. Why does it matter that she is a princess? She’s not a tamed, refined, Cinderella, or Belle. She’s got wild flamin’ hair and she’s wild. So in a way, wouldn’t her being an unconventional princess be good because she’s breaking a stereotype. Also, if the answer is because the magic and her being a princess means that it’s a fantasy world (which was the argument I most commonly found) and that tells little girls that strong female characters only exist in a fantasy, then I ask this: Aren’t most children’s movies fantasies? Or even within Pixar they are. Anything with talking inanimate object or animals. Unless it’s a full blown other world (i.e. Avatar with blue people) I think children can tie it to this world. A magical forest is still a forest. Sure there’s talking animals but it still looks like a forest. Little Mermaid is still in a sea/ocean that we recognize as our own. Even the Incredibles is placed in a setting which we see as a city we can recognize. Yet, I would still deem these fantasy movies. Unless we’re talking like How to Train your Dragon, in which dragons are not real…but even so. I think the focus should be more on what do the characters represent because I think kids can learn from any character. I saw it argued a lot that young girls deserve characters where they can “see a reflection” of themselves. That belief is teaching children then to recognize their selves in others based on who they look like. Instead, as a society the focus should be on teaching children, boys and girls, to see positive qualities they have, and want in others. This would also aide in further teaching kids empathy. The emphasis shouldn’t be on gender but on the morals. Wow, that was longer than I meant and I still cut it short. Sorry. Just some thoughts. You raise some excellent points and your paper sounds great! I don’t actually have an issue with her being a princess as of yet. I’m just a little skeptical and bracing myself for the film to end with her somehow being contained back to the feminine realm she’s rebelling against. Maybe they will let her be wild and free, but it would not be at all surprising if her liberty were somehow compromised. If I remember correctly, that sort of happened in Disney’s Mulan, for example. Also, I pick up on the princess bit partly because “pink princess culture” has been under a lot of scrutiny lately for the ways it commercializes and restricts young femininity. Peggy Orenstein’s Cinderella Ate My Daughter (http://peggyorenstein.com/books/cinderella.html) is fabulous and funny on this issue. I think Brave could be a fun, tough, rebellious counter to pink princess culture and the problems therein, but we won’t know for sure until we can see the whole movie.